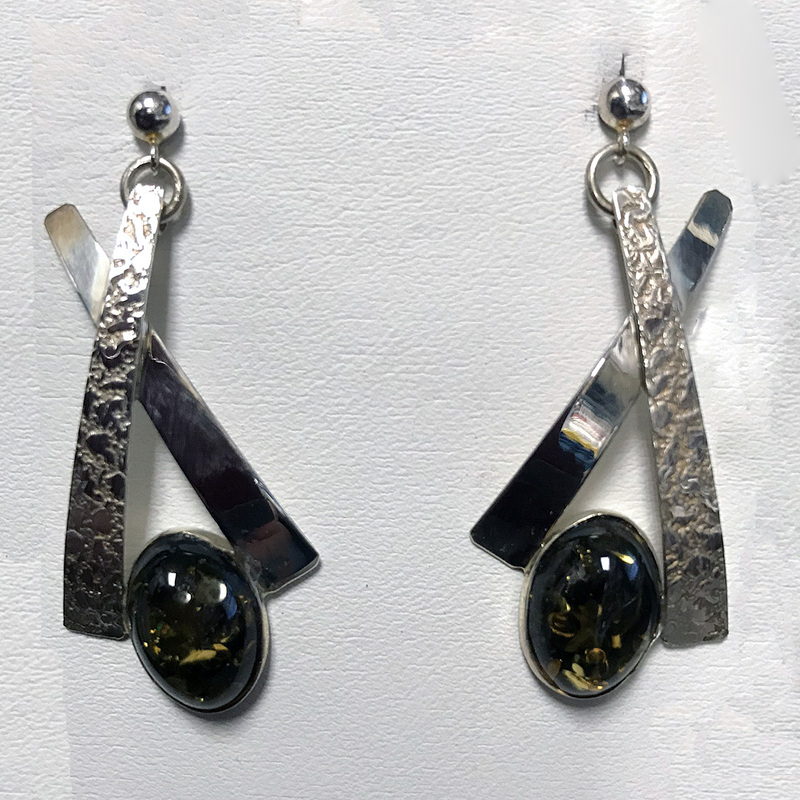 Textured Jewelry - This is a handcrafted pair of elegant dangle earrings created from high polished and textured strips of sterling silver that are accented by oval Green Amber cabochon gemstones. They are light, fun and have a lot of movement. From our Textured Silver Collection, this is a handcrafted pair of Sterling Silver earrings created from high polished and textured sterling silver. 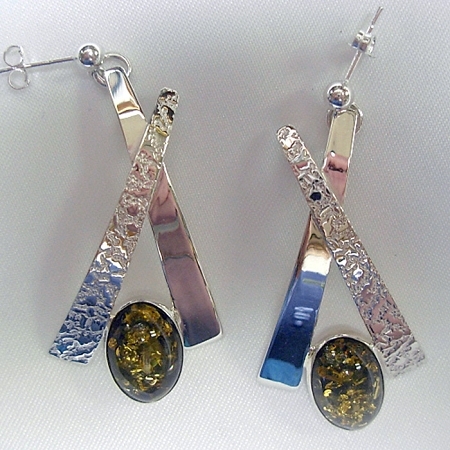 These earrings are accented by oval Green Amber Cabochons encased in sterling silver. They are light and fun and have a lot of movement and complete any outfit. These earrings make a statement on their own or worn with a necklace. They are designed to also complement our other designs from our Textured Silver Collection. •	These earrings measure approximately 1.75" long x .84" wide. •	The Green Amber cabochons are approximately .57" long x .4" wide (14mm x 10mm). •	Amber calms the nerves by releasing anxiety and tension, irritation, & feelings of being overwhelmed. Alleviates depression and increases clarity of mind. This is a very good stone for someone who is grieving or depressed but needs to make important decisions. •	Shown with a post/butterfly earring back. •	Also available in clip, French hook, or lever back. They are designed, created, and initialed by Aaron Rubinstein and Modern Art Jewelry. Each purchase is shipped in a beautiful presentation box to impress your loved one. We also gift wrap, and if you would like, provide a handwritten card.